Sneak peek at the bargain box. 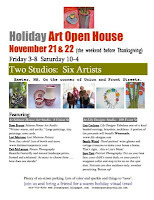 Lisa, Lori, Deb, Sandy, Jaye and I have been doing double time to get ready for our Holiday Open House. I found a few treasures to offer up for the creative thrifty. You get a discount ...plus 25% of the proceeds from the bargain box sales goes to Cross Roads House. Original art, pottery, stunning one-of-a-kind beaded creations, photography, hand painted wine glasses, and my world famous vegetarian sushi are on for Friday night. Join us! These little sketches are a mere 2.5x3.5 inches. I love doing them... they are fun to plan, fun to use for bigger work, fun to just play around with for the compositional possibilities. They are all acrylic on a canvas frame, sealed with a UV resistant varnish, and come with a tiny little artist bio to match the size. You can see them at my Open House this Friday and Saturday. Barn in a Blue Field is a pleasant departure for me from my usual strong golds and oranges. I feel as if I am being pulled deep in to the painting even though the size is a small 6x6. This painting is acrylic on board, sealed with a UV resistant varnish and framed in a trim little rosewood colored frame. The price is $125. It is one of many small paintings set for my open house November 21 and 22. Happily, the little 4x6 painting in my earlier post below, Fort Rock Farm Landscape, found its way to a family with three children who attended the Montessori school there on the property. And to continue the farm theme... Divine Cafe and Grill is hosting a Flapjack Fundraiser for the Save Fort Rock Farm Fund this Sunday, 8-5, $12 adults, $8 children. Join them for a fabulous gathering of friends and good food (and real maple syrup!). My postcards pictured to the left will be on sale as part of the fundraiser. $12 for a pack of 10 with %50 of each purchase going to the fund. Please, send my color to a friend. I couldn't resist a different approach to the previous Fort Rock Barn painting. This painting, "Fort Rock Farm Landscape", is a very small 4x6 inch acrylic on paper board. It is one of many 4x6 paintings I recently completed for my upcoming Open House on November 21 and 22 (see below). Some of the paintings are landscapes, some are abstracts, some are just experiments with color. I love this small format for its instant gratification... it is a great way to progress to larger work. My painting of "Wild Horses" from the previous post found a quick home. It was SOLD to a horse lover. Thank you for looking at my color! Please, share it with a friend.